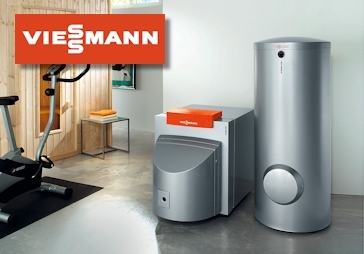 Smithfield Plumbing & Heating Supply® is pleased to now offer a full line of Viessmann heating products. The Viessmann Group is one of the world’s leading manufacturers of heating and renewable energy systems. Family-owned since 1917, Dr. Martin Viessmann leads the company into its third generation. The company employs over 11,400 employees worldwide and has sales in excess of 2.5 billion dollars. Viessmann owns 27 manufacturing facilities in eleven countries with an additional 120 sales and distribution facilities in Germany and seventy-four other countries, strategically placed to provide a strong global brand presence. Viessmann believes in creating a multi-level, top quality program of high-tech, state-of-the-art heating products. Viessmann offers a wide range of wall-mounted gas-fired condensing boilers, floor-standing oil- or gas-fired hot water heating boilers, solar thermal systems, advanced controllers and DHW storage tanks, not to mention an extensive range of commercial style high output system boilers – all designed to achieve superior performance, reliability and energy savings. With Viessmann's current comprehensive product range, accountability for the environment and society, fairness when dealing with business partners as well as the pursuit of perfection and maximum efficiency in all business transactions, allowing us to offer to our customers the benefit and added value of a strong brand. Stop by any of our branches today for more information, prices and availability on the full line of Viessmann products available. At Smithfield Supply we offer a wide array of services. We have Experienced, licensed professionals who can help in many situations. If there is a service not listed please inquire we really could not list everything. Smithfield Plumbing & Heating Supply and Your Kitchen & Bath logos are registered trademarks of Smithfield Plumbing & Heating Supply Company, Inc.
© 2008 Smithfield Plumbing & Heating Supply Company, Inc. All rights reserved.